DJ Studio Pro is the ultimate music player and audio toolkit, that allows you to mix your favorite music like a professional DJ! Great for special occasions, clubs or just as your main player. DJ Studio Pro is full featured Twin deck player with manual and automatic fading between decks. It includes seven other audio utilities: Audio Converter, CD Audio Grabber, Audio Editor and Splitter, Smart ID3 TAG Editor, Lyrics Editor, Album Cover Image Editor, CD Audio Creator and Burner. DJ Studio Pro plays all file types including M4A (iPod aac), MP4, MP3, Windows Media Audio, Real Player, Apple QuikTime and Ogg Vorbis. Standard play, offset play and cross fading. You can play tracks directly from CD, the track loads to memory in seconds, you can then remove the CD and insert another CD, the track will play to the end. Plays all file types – Twin deck mixer player. Manual and automatic variable speed fading between decks – Adjust speed without changing pitch. Offset & Effect play buttons – Fade stop and fade down buttons. Create offset play points for each song. Playing CD’s – you can play tracks directly from CD, the track loads to memory in seconds, you can then remove the CD and insert another CD, the track will play to the end. Database with fast search and queue. CD tracks quickly loaded into memory so another CD can be inserted without interrupting play. 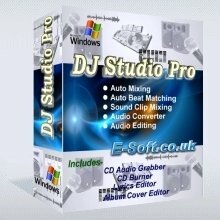 Audio and CD conversion, ID3 Tag Editor, Album Cover Editor, CD Creator Burner, Audio Editor, Splitter, Joiner – LRC Karaoke Lyrics Creator, Steinberg VST Effects Plug-Ins, DirectX Effects.